You will rarely see SCSI (Small Computer Systems Interface) ports on modern desktops or laptops these days. 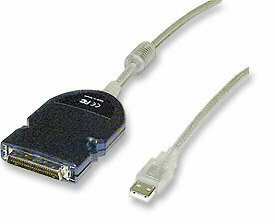 Turn any USB port on your computer into a 50-pin SCSI port with this adapter. 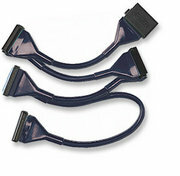 This 7-device Ultra-320 SCSI ribbon cable provides the most efficient and effective way to put to use your SCSI devices (hard drives, printers, etc.). SCSI (pronounced "scuzzy")is the ultimate computer-to-peripheral interface which boasts onboard processing increasing the speed of information transfer. This ribbon cable is 53 inches long and has an LVD/SE terminator. 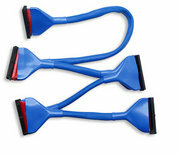 It has 68-pin pinouts and can be used it to connect up to seven SCSI hard drives for more efficient performance.